The world can be a terrible place, but there are always things to cheer us up. Amazingly, they sometimes overlap. A great number of the things we use every day only happened because of terrible tragedies and torture. Next time, you gorge yourself on Twinkies or put on makeup in the mirror, remember that your joy could not exist without someone else’s pain. Like their most famous product, Hostess should have expired a lot earlier than they did. 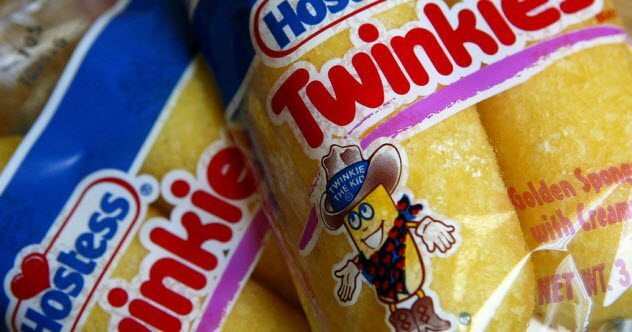 During the Great Depression, when most companies were on the verge of collapsing, Hostess only stayed in business for a limited time. James Dewar’s original shortcake recipe had strawberry filling. The problem was that strawberries were only in season for two months. While the economy around them crumbled, staying open for 60 days of the year no longer seemed like a suitable business model. To accommodate, they switched to a filling available year-round: bananas. These new banana cakes, or “Twinkies,” were a big hit. However, their success was short-lived. Following America’s entry into World War II, the government placed a ration on bananas. Again, Hostess had to find another filling. During the war, they used vanilla. The switch was originally meant to be a temporary measure to outlast the ration. To Hostess’ surprise, vanilla cakes were much more popular than the banana ones. Even after the ration ended, they never went back. All of rock and roll is built around power chords. It can be heard in songs by AC/DC, Nirvana, The Who, Led Zeppelin, The Kinks, and Neil Young. Power chords are so essential to rock songs that they’re usually the first thing young guitarists learn. 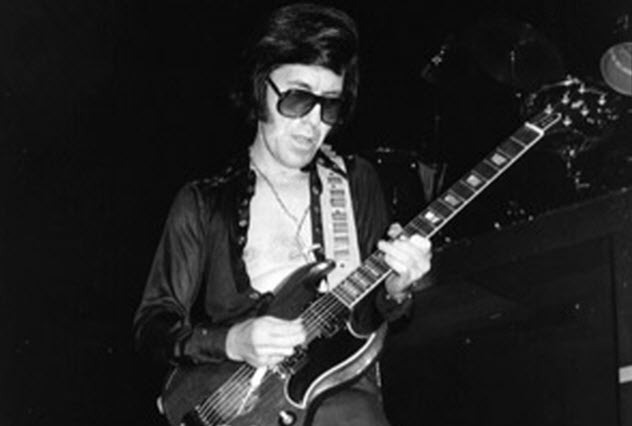 All of this can be traced to Link Wray and his 1958 song “Rumble.” Though it is now considered one of the greatest songs of all time, Wray originally didn’t want to play it. Ever since he was a kid, Wray wanted to have a career as a singer. But before he could set off for show business, he had to serve in the Korean War. That decision cost him his dreams. The jungles of Korea were a breeding ground for diseases. Like a lot of his fellow soldiers, he suffered from a dreadful bout of tuberculosis. It was such a bad case that he had to have one of his lungs removed. No longer able to sing, he was forced to innovate as an instrumentalist. His hopes may have been dashed, but inspiring multiple generations by creating the bedrock of rock and roll and being labeled as the father of punk and metal is a good legacy, too. Following the decimation of the German economy in World War I, the German public was undernourished. The limited food available mostly went to adults and returning veterans. As a result, children were the most affected by the famine. In unprecedented numbers, children developed rickets due to a lack of vitamin D, calcium, and phosphate. At the time, nobody knew what caused rickets. Dr. Kurt Huldschinsky developed a thesis. 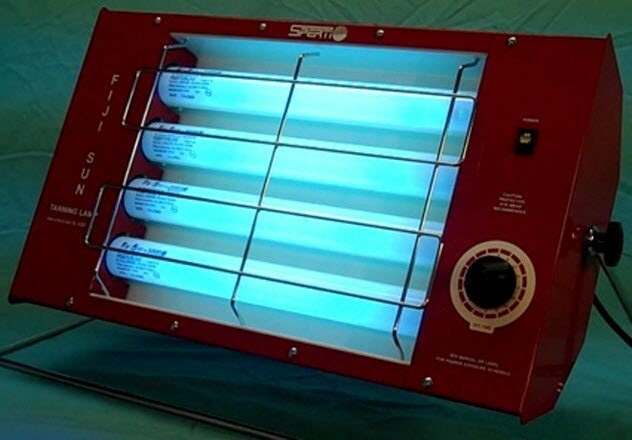 He noticed that all the patients were pale, so he made a lamp that emitted ultraviolet light to see if the children got any better. It worked. The ultraviolet light cured the disease, and he started marketing the sunlamp. This design would serve as the prototype for the recreational tanning bed, thus giving a generation of celebrities and politicians that radioactive glow and inspiring countless urban legends. In 1816, Mount Tambora erupted in Indonesia. It immediately killed 4,600 people. So in the first 15 minutes, it was already a terrible disaster. The dust storm it unleashed killed another 10,000. By the end, the volcano caused enough famine and disease to kill 90,000 people. For humans, it was a horrific event. For horses, it was an unprecedented disaster. The soot traveled to Europe that summer, blocking the Sun for months. Without sunshine, oat crops across the continent died. Unable to eat their staple crop, horses began to die by the thousands. Those horses that stuck around to eat the remaining crops were too much of a burden for the poor farmers, so the horses were shot in their heads. As horses were the main form of transportation, people had to look around for a new way to travel that didn’t require food. One such inventor, Karl Drais von Sauerbronn, created the dandy horse. 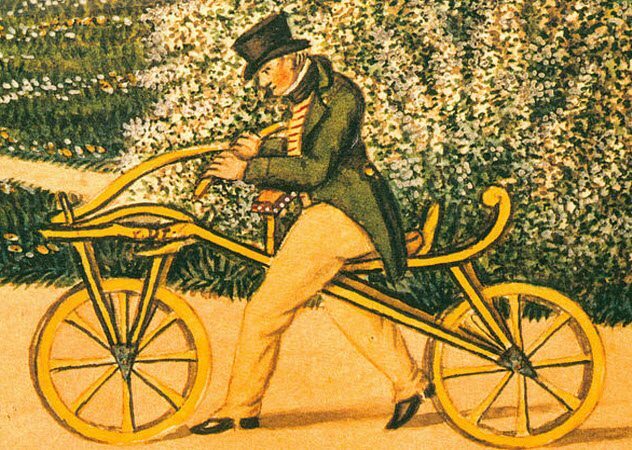 Named after the animal that had been just been murdered or starved to death by the truckload, the dandy horse was the first personal propelled bicycle. In the 1850s, Edmund McIlhenny was a successful banker. In the 1860s, he was bankrupt. The Civil War had ruined his business. With no more money, he moved back into the home of his parents-in-law on Avery Island, Louisiana. But his luck was about to turn around. Little did he know, the family’s estate was built on a giant salt rock. He mined the salt and made a fortune selling it to the Confederacy. When the Union found out about this strategic reserve of salt, they attacked his salt mine and burned down his farm twice. Afraid for their lives, the family was forced to flee to Texas. When McIlhenny returned to Louisiana after the war, he planted a vegetable garden. To pile on the bad news, everything he planted died in the salty, burned ground. In New Orleans, he met a war veteran who told him about some pepper seeds he had from Mexico. 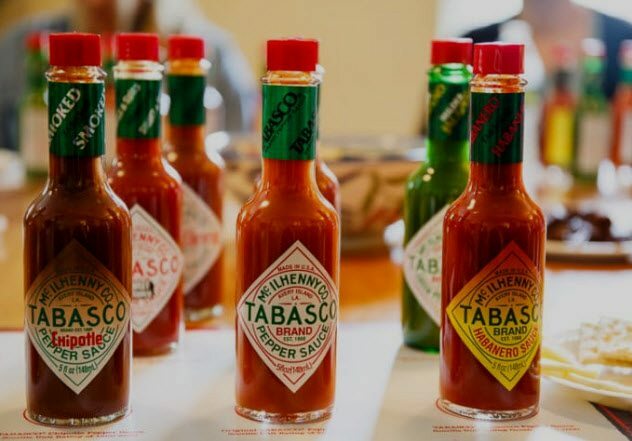 McIlhenny made the first bottle of Tabasco sauce from these seeds. Later, his sons would mass-produce the sauce. It became a hit because it added some necessary flavor to the bland food available during the Reconstruction. It is the same spice that we put on our bland food today. The tragic and untimely death of Robert Kennedy had tremendous consequences on 1960s politics. However, his real legacy may be the roundabout way that his death influenced hip-hop. In 1968, Michael Viner joined Robert Kennedy’s campaign as an aide. There, he met famed football player Rosey Grier, who was working security for Bobby. Grier was the one to wrestle the gun out of Sirhan Sirhan’s hand. Grier and Viner planned to work in Washington with Kennedy. When Kennedy died in California, Grier and Viner stayed there. Both men went to work in the movie business. Grier starred in and Viner produced the soundtrack for a forgettable B movie The Thing with Two Heads. “Apache” by the Incredible Bongo Band went on to be known as “hip-hop’s anthem.” Popularized by DJ Kool Herc, “Apache” became the go-to song for his block parties. It was the first song “Grand Wizzard” Theodore scratched, pioneering turntablism. By doing so, he turned it into the sound of the genre. Hundreds of artists—including Afrika Bambaataa, Grandmaster Flash, Nas, Kanye West, LL Cool J, and even MC Hammer—would go on to sample it. Following the destruction of the Napoleonic Wars, England was in desperate need of a workforce. Prisons supplied a large crop of new workers. In 1817, Sir William Cubitt came up with the first treadmill, which was more like the modern stair-climber. Prisoners walked on spokes that turned a giant wheel. 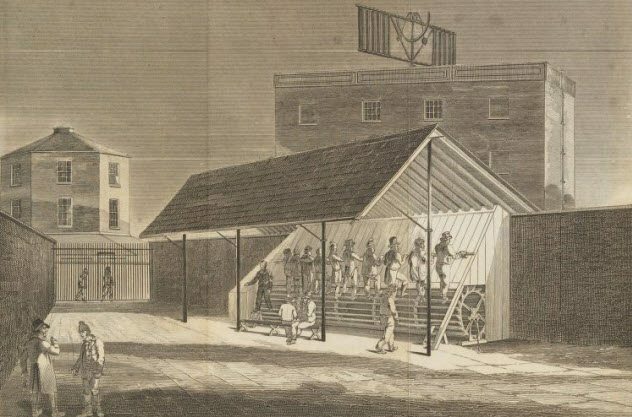 Their momentum crushed grain, churned water, or powered mills—hence the name treadmill. These devices were excruciatingly painful. People would have to walk for six hours straight and climb a total of 4,300 meters (14,000 ft). That is almost half of Mount Everest every day for five days in a row. Worse, if you did not move the wheel, you would fall off and the wheel would keep spinning. Prisoners were injured daily. These treadmills were outlawed in England as cruel and unusual punishment in 1898. The treadmills at the gym may feel like torture because they once were. Dunking booths are the staple of fairgrounds and church carnivals everywhere. They combine feats of strength, lightly hurting someone, and amusement. It is fun that anyone can get behind. Behind painted plantation scenes, black men stuck their heads up. The thrower would then try to hit the living human in the head with a baseball. If the thrower hit the target, he got a prize. 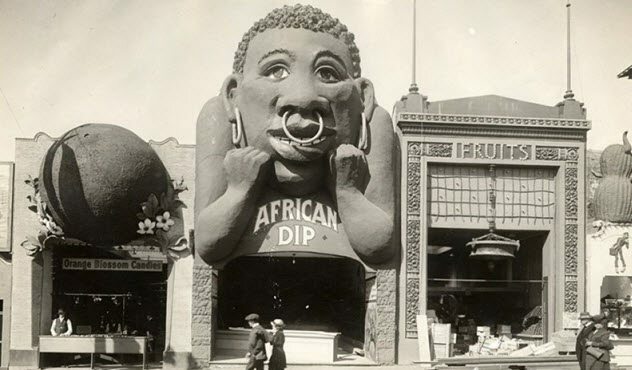 The two games were brought together to make the “African Dip.” In these new games, the thrower hit the target and triggered a release, causing the black person to fall in the water. Eventually, anybody could sit up there and take a plunge. 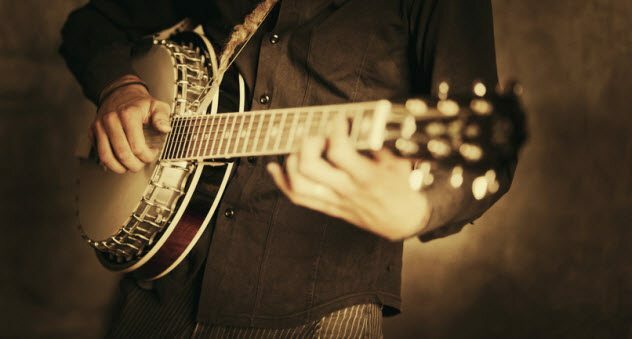 The banjo is the preferred instrument of Appalachia, Muppet frogs, and Steve Martin. However, it has a backstory even darker than Deliverance. In the 1600s, slave ships had a problem. Their slaves would become sickly and die. This was not a problem because their fellow humans were suffering; the slave owners were just losing profits. So to keep their slaves healthy, the owners let their slaves dance. Logically, the slaves weren’t really in the mood to do this. But slave captains thought that traditional African instruments might convince them to dance. They chose stringed instruments. That is how the banjo was brought to the United States. It would have remained an obscure instrument in American culture if not for the minstrel show. When minstrel shows were making fun of slaves, they included the image of a lazy slave playing the banjo. The instrument then became popular among the white theatergoers. You may not know it by name, but somewhere in your house is Retin-A. 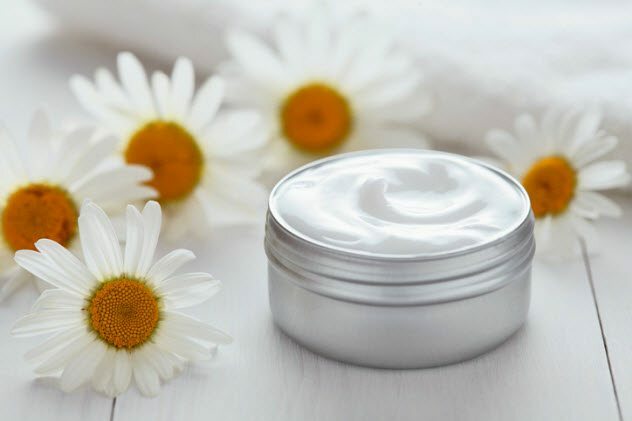 All modern cosmetics use Retin-A, which is the active ingredient in most acne medicines and wrinkle removers. It is so prevalent in our society that the World Health Organization calls it “one of the most important medications needed in a basic health system.” Though it may seem benign, this “youth in a jar” and other drugs only came about by forced experimentation on prisoners. Following World War II, human experimentation was outlawed everywhere after the passage of the Nuremberg Code. Everywhere except Philadelphia, apparently. From 1951 to 1974, dermatologist Albert Kligman went to Holmesburg Prison to test new drugs on the prisoners. At first, he said that he saw the prisoners not as human beings but as “acres of skin.” Funded by the CIA, Dow Chemical, and Johnson & Johnson, Kligman used the prisoners as biological guinea pigs. Some of his greatest hits include pulling the skin off people with Scotch tape, yanking out fingernails, directly pouring Agent Orange on open wounds, slipping LSD to patients, and forcing people to stay in rooms with radioactive isotopes. The most common treatment was giving prisoners experimental versions of the drugs to monitor the effects. One of the many drugs developed this way was the first iteration of Retin-A. An unknown number of people died from these experiments. Nate Yungman is a freelance writer. Make sure to check out his other lists for Listverse. For more suffering, you can follow him on Twitter. If you thought this list was torturous itself, then you can email him complaints or questions at [email protected]. Read more about the bizarre history of innovations on 10 People Killed By Their Own Innovations and 10 Disgusting Materials Used For Great Innovations.